On December 5, 2018 the Government of British Columbia released its CleanBC plan aimed at reducing climate pollution, while creating more jobs and economic opportunities for people, businesses and communities. The CleanBC plan builds on recent announcements, such as mandating 100% of new cars to be zero-emission vehicles by 2040; providing rebates for efficiency upgrades including insulation and heat pumps; signing a memorandum of understanding with business on a low-carbon economy; and intervening in court to support carbon pricing across Canada. CleanBC highlights four pathways to a cleaner future. Each includes significant actions that help us to use energy more efficiently and prevent waste, while making sure the energy we do use is the cleanest possible. It also sets out an effective blueprint to support building our economy - by leveraging our skilled workers and natural resource and technology sectors to reduce climate pollution and create economic opportunities across the province. 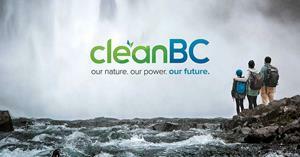 We invite you to read the CleanBC plan and see the BC Government news release. Image on the left courtesy of the Province of B.C. The BC Climate Action Toolkit is provided by a three-way partnership between the Green Communities Committee (with representatives from the Province of BC and the Union of British Columbia Municipalities) and Smart Planning for Communities, a program of the Fraser Basin Council.